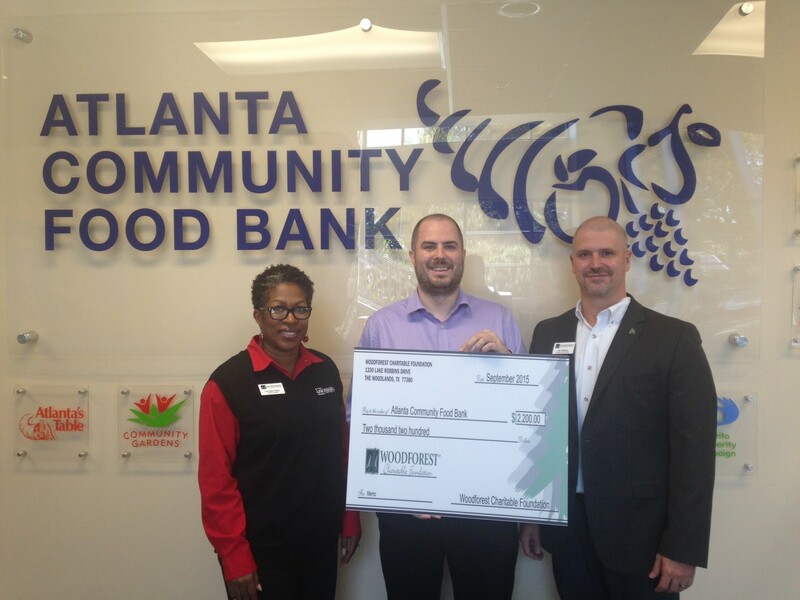 Atlanta Community Food Bank receives a donation from Woodforest Charitable Foundation. Photo Caption:Presenting the check from left to right are: Lorraine Taylor, Woodforest National Bank Retail Branch Manager; Greg Sims, Atlanta Community Food Bank Annual Giving Manager; and Joe Allmaras, Woodforest National Bank Retail Regional Manager. Atlanta Community Food Bank recently received a $1,800.00 donation from Woodforest Charitable Foundation and Woodforest National Bank. The Woodforest Charitable Foundation was created by Woodforest National Bank in 2005 as a direct result of its desire to support and invest in the communities in which it serves. The Foundation is committed to assisting those in need, enriching lives and communities through dedicated leadership and faithful administration by providing funding to qualifying 501(c)(3) charities. For additional information regarding the Woodforest Charitable Foundation, call (832) 375-CARE (2273) or visit the foundation’s website at www.wcf.org.